Many consumers are looking for effective safe solutions to give them peace of mind that their family’s drinking water supply is safe and healthy. 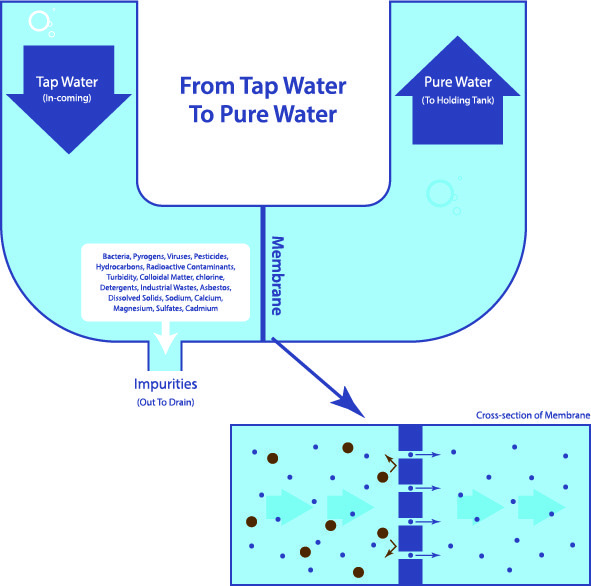 This page answers many of the most common questions that we are asked by customers and even provides some helpful diagrams to illustrate the main parts of a Reverse Osmosis System. What does a Reverse Osmosis Filter System Do? Why is it called "Reverse" Osmosis? What are the components of a Reverse Osmosis System? How effective is Reverse Osmosis? What Makes MineralPro's RO system different? Reverse Osmosis or RO for short, is a water filtration technology that uses semipermeable membranes to “block” larger particles and allow only clean water to pass through. Provided a high quality “certified for drinking water ” filter is used, Reverse Osmosis systems are among the most effective water purification technologies available on the consumer market . RO systems are both energy efficient and environmentally friendly compared to other filtration methods and bottled water alternatives. Reverse Osmosis systems for home or office use are powered by water pressure which forces incoming “dirty” water through the membrane allowing only “purified” water to pass through to the facet and washing the concentrated “dirty” water down the drain. Given sufficient water pressure – minimum of 40 PSI – no external power supply is needed to make the RO system work. Semipermeable membranes used in drinking water RO systems are polymer based and consist of many very thin sheets or layers of a material that with billions of tiny holes in it. Water molecules can pass through these holes, but salts, lead molecules and thousands of other impurities and toxins cannot pass. Using the natural water pressure of your home or office’s pipes, the RO system performs a multistage filtering of incoming polluted or impure water. At each stage impurities are removed starting with sediments and larger particles, and ending with the Reverse Osmosis membrane removing the smallest impurities such as salts and viruses that other filters have not filtered out. The RO system sends the clean water to a storage tank and flushes the impurities and pollutants in the dirty water down the drain. Osmosis is a natural process that occurs in Nature. Without Osmosis trees and other large plants would not exist. Neither would we, as Osmosis is a key means by which water is transported into and out of the cells of our bodies. In “nature” water tends to cross a semi permeable membrane from the “clean” or less concentrated side to the “dirty” or more concentrated side as it seeks to average out the amount of solute (inorganic solids dissolved in the water), or “pollutant” . Since the larger molecules cannot cross the membrane but water can, it seeks to achieve a balance where both sides have the same concentration of water and solute. In reverse osmosis water is forced from the “dirty” or high concentration side to the “clean” or low concentration side by use of pressure. This forces water to flow across the membrane against its natural direction or in “reverse” and allows us to create clean highly drinkable water from polluted or even toxic water. Cold Water Line Valve and Connecter Pipe: The valve inserts into your existing cold water supply line under your sink. The pipe takes water from the valve to the RO filtration system. Pre-Filter: Water from the cold water line is first sent to the Pre Filter. The first stage of your RO system is a five micron sediment filter that traps sediment and other particulate matter like dirt, silt and rust which affect the taste and appearance of your water. Pre Carbon Filter: The second stage contains a carbon block filter. This helps ensure that chlorine and other organic materials are removed from the water prior to the Reverse Osmosis Membrane stage. By doing so the fragile RO membrane is protected from chemicals that can damage it and reduce its effectiveness. Reverse Osmosis Membrane: Stage three is the heart of the reverse osmosis system, the RO membrane. This semi-permeable membrane will take out salts, minerals, metals, bacteria, viruses, cysts, and much more. Because the process of extracting this high quality drinking water takes time, your RO water treatment system is equipped with a storage tank. Natural Mineral Balancing and Coconut carbon Filter: The 4th and 5th stages are combined into a single filter cartridge. The Natural Mineral Balancing consists of naturally occurring minerals which returns the water to its natural state by stabilizing the pH to slightly alkaline and provides the water with healthy natural minerals such as magnesium, sodium potassium and calcium. The Natural Coconut Carbon filter provides a final polish for crystal clear, high quality, crisp tasting water! This filter actually sits between the storage tank and faucet and thus provides that final polish just as you are pouring the water ensuring it is the best tasting water you can drink! Automatic Shut off Valve: To conserve water, the RO system has an automatic shutoff valve. When the storage tank is full (the timing may vary based upon the incoming water pressure) this valve stops any further water from entering the membrane, thereby stopping water production. Once water is drawn from the RO drinking water faucet, the pressure in the tank drops and the shut off valve opens, allowing water to flow to the membrane and waste-water (dirty water with contaminants) to flow down the drain. Storage Tank: The standard RO storage tank holds up to 2.5 gallons of water. A bladder inside the tank keeps water pressurized in the tank when it is full. MineralPro provides the highest quality tank in the industry made of FDA approved Food Grade plastic that never rusts or leaches chemicals into the stored water. Faucet: The MineralPro Reverse Osmosis system uses its own faucet, which is typically installed on the kitchen sink. Several options are available to match different decor and user needs. Drain line: This line runs from the outlet connecter of the Reverse Osmosis membrane filter to the sink drain. Because RO systems are self-cleaning and flush the concentrated waste water down the drain the proper installation and positioning of the drain line is important. The RO system drain line is used to dispose of the impurities and contaminants found in the incoming water source (tap water). Reverse Osmosis is used by many cities to make municipal drinking water with factory sized plants converting salt water to drinking water. Reverse Osmosis systems perform what is known as “hyper” filtration which removes particles larger than 0.1 nanometres in size, smaller than a cold virus and 1000x smaller than most bacteria. Home and office RO systems are powered by the water pressure in your pipes and generally do not need to have any additional power to produce purified water on demand. Quality Reverse Osmosis Systems use RO in combination with other filter types such as sediment filters and activated carbon filters to provide a “complete” solution for purifying tap water delivered into your home or office. Reverse Osmosis is among the most effective means of purify water that exist. Ultimately its performance is affected by the incoming water pressure, water temperature, type of pollutants that are in the tap water and quality of the membrane material used. 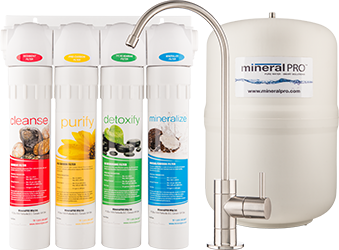 MineralPro use the highest quality membranes and components available in the market and thus removes more impurities than typical RO systems. Green technology – uses no energy! Provides one of the lowest costs per litre/gallon of any filtration method – well over 10x cheaper than bottled water! With simple annual maintenance will provide your family and friends with pure clean water for decades! Below are the various particulate removal thresholds for various water purification methods. Aside from the superb quality of the components that we use there are a few other key benefits of owning a MineralPro Reverse Osmosis System. Only MineralPro offers our unique “Mineralization” cartridge. Reverse Osmosis is so effective at removing minerals from water that it also removes beneficial minerals you want in your water such as magnesium and calcium and Potassium. Our proprietary Mineralization cartridge adds back essential and desirable minerals and also “polishes” to give it a taste and pH balance that your body will recognize and the best tasting mineral alkaline water you can get! Our quality components include only certified Food Grade parts including a high quality food grade plastic storage tank that will never rust or wear out unlike many systems that use lesser quality metal tanks. A final polish to the water is achieved by the last stage made up of carbon from coconut husks – the purest form of carbon available, resulting in fresh, great tasting, healthy water, always produced fresh on demand! Filter changes are super simple with our proprietary flip up and turn system. No need to turn the water supply off or worries about putting the wrong cartridge in the wrong place. Annual maintenance can be easily performed in 2 minutes or less with no worries about leaks or putting a cartridge in the wrong place.